I flew back to New York for Labor Day weekend with all the gusto to create a new blazer. Last weekend I had it in me to create a new (hot pink) blazer. It was the first garment I had completed in a long time and it felt really good. So all week I fantasized about what I'd make this weekend. I thought I had solved the issue of having moved all my sewing stuff to LA, but I quickly realized that dealing with a borrowed sewing machine and the lack of essentials such as fabric scissors, the task was just too tedious. 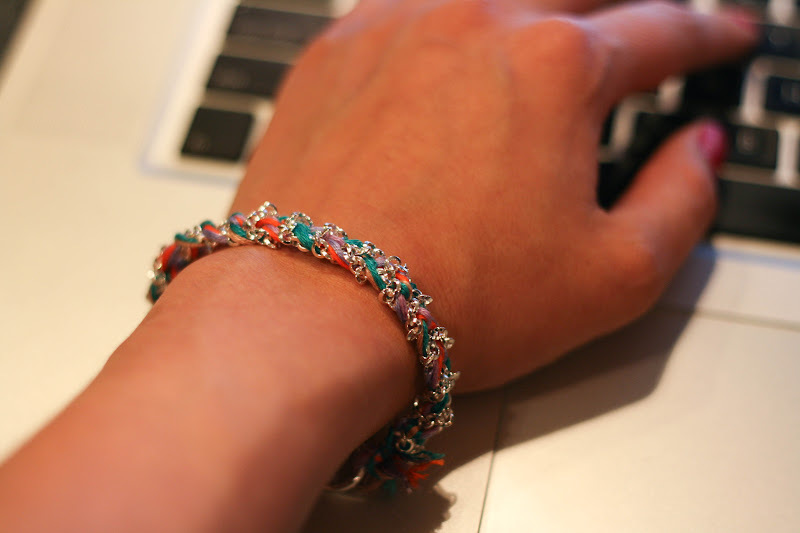 Inspiration came from all the chain + embroidery floss bracelets I've seen out there. Yes, I'm jumping on the bandwagon super late, but I don't care. I also was inspired by the Fall 2012 Panetone colors! Since I was a friendship bracelet making fiend as a child, I basically own all of the colours of the rainbow of embroidery floss that could possibly exist. I figured we might as well get ready for fall since it's September already. While I really don't want summer to end, I can't wait to see a gorgeous New England autumn. I swear, Maratha Stewart style autumns do exist. Here are the directions assuming you're NOT going to use ghetto-hammer-pliers and will actually have a pair of scissors. 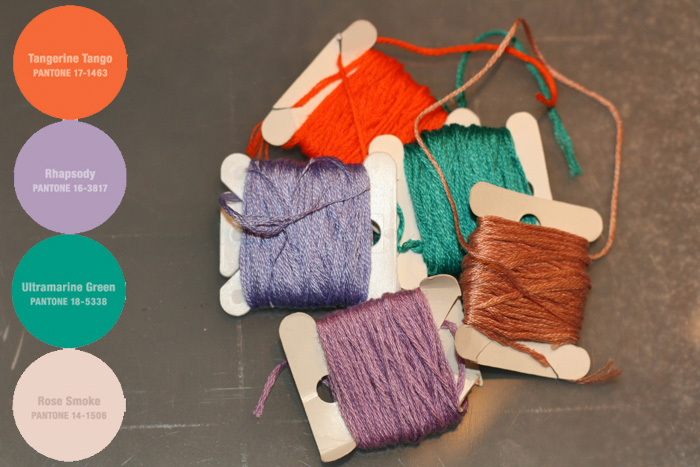 6 strands of embroidery floss in a bunch of colours, you want to cut these double the length of the circumference of your wrist. So, just wrap that baby twice around your wrist and cut. 2 strands of rollo chain, I used medium sized silver plated rollo chain from artbeads.com found here. You want these chains to be cut a few inches longer than the length of the circumference of your wrist. I'd recommend adding 2-3 inches Hint: this is where I had to extend my chain WITHOUT real pliers or jump rings. Can you say ghetto? So you really want to work with more chain than you need and cut off the excess. Create two groups of three strands of thread each. Thread each group through one of the chain ends. 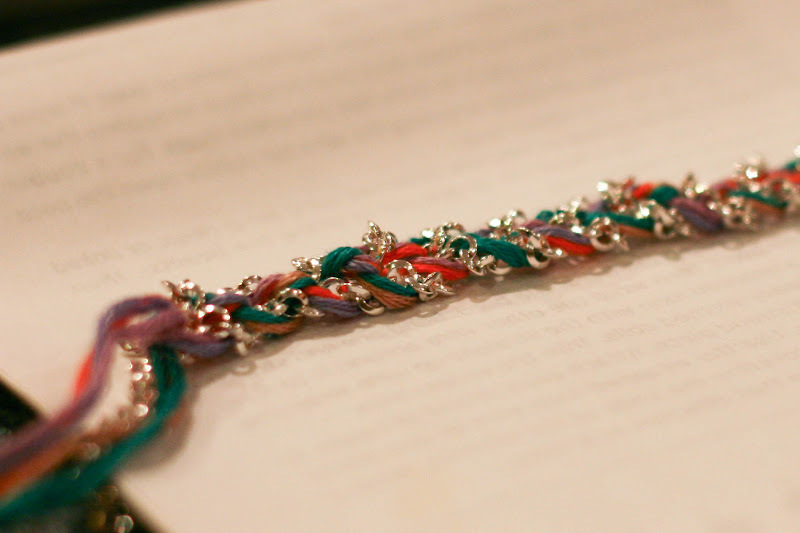 You will now have two pairs of chain-thread pieces. Tie the thread ends to a large jump ring. Now you will start to ghetto-fish tail braid. (Ghetto seems to be the theme of this post). Do this by making a single knot between the two floss strand groups. Wrap the threads on each side OVER the chain and then under. 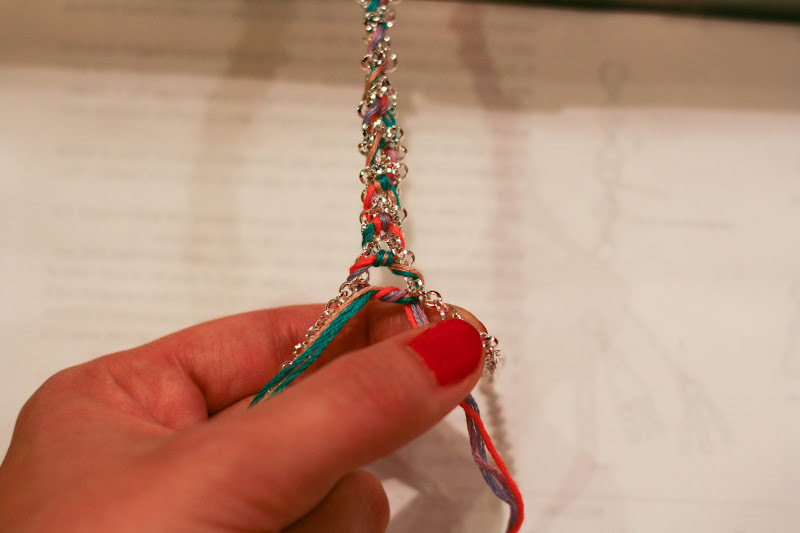 Repeat the knot of the thread groups and keep on going until you're at your desired bracelet length minus the clasp size. 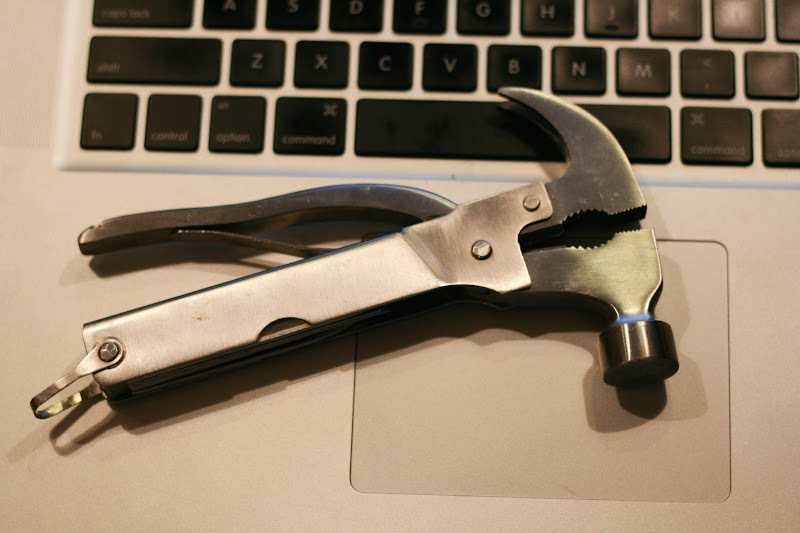 NOBODY knows what this tool is. Seriously. If you know what this is, please let me know. Haha.